There must have been disappointment at the BBC2 when the first programme in its documentary series The Planners drew only 1.3 million viewers, some 5.5m fewer than would be expected for the peak time slot. Days after the controversial announcement of the northern extension route for the HS2 railway, this portrayal of how developers, local authorities and the public are reacting to the government’s stripping away of planning controls to encourage construction with the aim of kickstarting the economy is both timely and engaging. Who cannot have felt sympathy with householders faced with losing their views of farmland on the edge of Winsford in Cheshire. They even pursued a fruitless hunt for great crested newts, a protected species, in their attempt to bock the building of 540 houses, with all that entails in disruption during construction work, additional traffic and the loss of an open aspect for which they’d doubtless paid a premium in house prices? You might have wondered why a human resources company boss could not have a dropped kerb to facilitate parking in the front garden of her Regency house in Pittville, Cheltenham, “just like her neighbours”, instead of having to manoeuvre round the back as if her car was a horse being led to stables? At least Basil and Rachel Thompson, retired GPs nurturing a beautiful garden in a grade two listed house in the shade of Chester’s historic city walls, were allowed to put 17 solar panels on the slate roof of their garage. Conservation officer John Healey objected to concealing wall walking tourists’ views of the slates with large modular reflective panels. Basil pointed out that the office block looming above the far side of the wall looked “just like a panel”. Indeed, redbrick Centurion House, boasted slate grey window frames and acres of glass arranged as if to resemble a fortress – lacking only Roman soldiers peering over the top. Healey said he could not “answer for the sins of those who were here in the 70s”. This failed to answer the Thompsons’ point that solar panels are a response to 21st century needs for sustainable energy. After the elected councillors voted through the installation, Healey was interviewed while looking down from the walls, oblivious to the blooms most tourists would have admired and with his back to the office block monstrosity rising behind him. It even had me jumping from my seat and prodding at the screen in astonishment. Still, even as the nimbys brief their lawyers in attempts to derail HS2 that are likely to delay its construction for years – not in my leafy acreage, please – you have to wonder if the balance has swung too far in favour of private developers. Planning officers and councillors alike must now calculate the likely costs of losing an appeal to the planning inspectors if they reject any application. That’s not treating an application on its merits. Developers who secure outline permission can return time and again, asking for more blocks and more flats. They can build closer to the neighbours than agreed drawings showed, yet not be forced to tear down the timber frames and start again. Both are examples close to my home in South Woodford, north-east London. 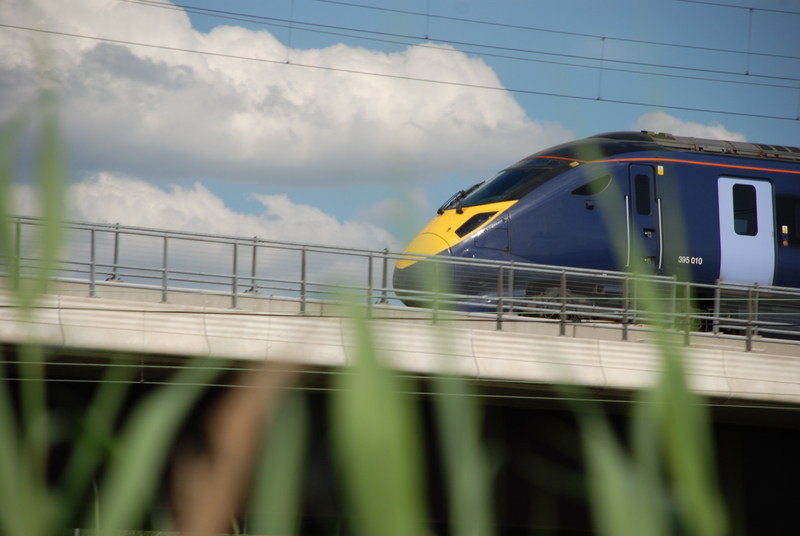 And while the predicted benefits of HS2 for the North and Midlands are now being questioned by academics and rail experts, such as Christian Wolmar, it is becoming all but impossible to stop a railway or a Thames bridge or a housing estate on a flood plain, all in the name of economic recovery. The Chinese, we are told to wonder as we were once told to work more like the Japanese, will have built thousands of miles of high speed railway while we dither over HS2. But in the bonfire of red tape, so beloved of Tory politicians at their annual conference, are we ignoring the growing clamour in China for controls to avoid preventable deaths in the breakneck race for growth? Would we accept the pollution-laden air of Beijing, where CNN last month reported an air quality index reading of 700? The World Health Organization regards 25 micrograms as healthy. There’s a telling quote in a People’s Daily Online article after fire killed 53 people in a 28-storey building in Shanghai in 2010. It raised concerns at the lack of fire safety measures and facilities in China’s biggest metropolises. “The drive for modernisation should also include the quest for a greater peace of mind,” the article said. It’s a lesson lost on British politicians engaged in dismantling protections for the public won at Westminster over many years, or seeking in Brussels to negotiate away workers’ rights in some à la carte European Union. This entry was posted in Politics, Uncategorized and tagged BBC2, Bureaucracy, business, China, Conservatives, Construction, Developers, Europe, European Union, Housing, HS2, Local government, Nimbyism, Planning, Railways on February 3, 2013 by paulnettleton.